It's Okay, They Aren't Ponies -- They're Raptors. People keep telling me it's wrong for a grown man to enjoy a cartoon about colorful pony friendship. Fine. How about colorful velociraptor friendship? The incredibly talented Brianna "Cherry" Garcia offers this splendid compromise. 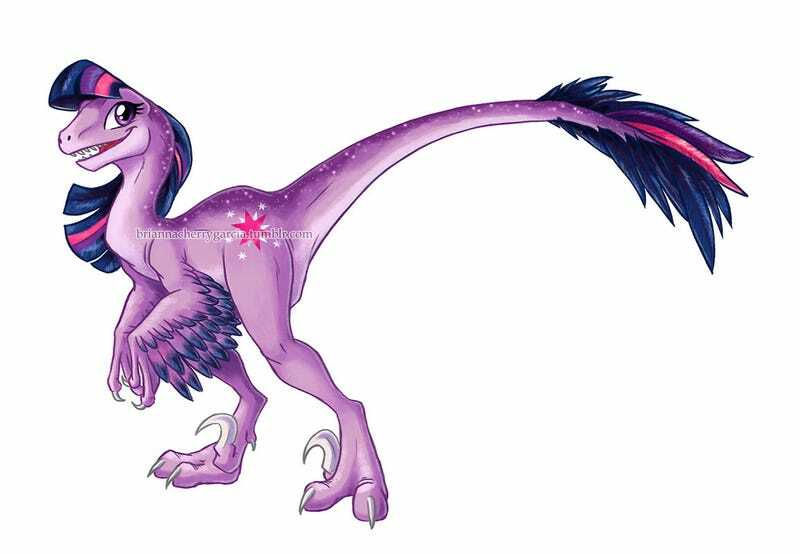 Somewhere between My Little Pony: Friendship is Magic and conforming to whatever society thinks a normal guy should like, there is My Little Raptor. It's essentially the same thing, only instead of hugs, these playful carnivores tear at each other with their powerful hind feet. They might as well just be plastic army men smoking cigars while doused in Drakkar Noir. Brianna performed dinosaur transformations on each of the show's mane characters, which can be found over at her Tumblr page. And should she ever make prints of these available at her society6 page, I shall be first in line.